I discover that today is National Winnie-the-Pooh Day. It is the anniversary of the birth of A.A. Milne in 1882. Milne, of course, is the author of the books and father of the real Christopher Robin. It is a good day to pull one of the books from the shelf (actually any day is). 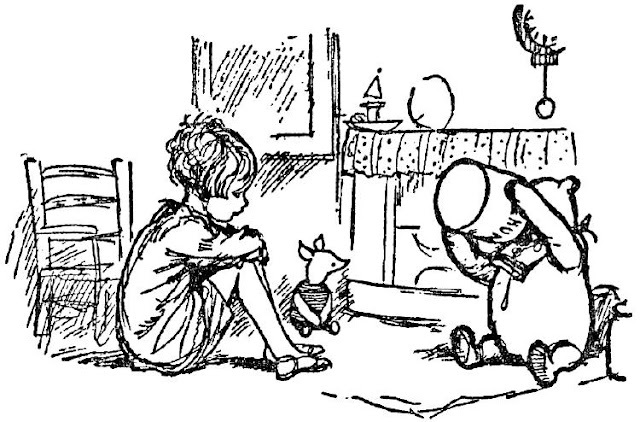 The first "Pooh" book I owned was When We Were Very Young, a gift on my 6th birthday, that isn't really about Pooh but does have Christopher Robin ("They're Changing the Guard at Buckingham Palace") and a favorite, "Disobedience" ("James, James, Morrison, Morrison, Weatherby George Dupree..."). Dad was in the Army and we were living near Camp Gordon, Georgia, near Augusta, in an apartment complex known as Myrtle Court. The gift was from a neighbor girl my age — I still have the book and there is an inscription: "Happy Birthday to Jimmy from Mimi." Dad often read to me and since I wouldn't have been reading yet I'm sure the first time I heard these verses were in his voice. I'm not sure I read any of the other Milne books until I was an adult.